Crowds of stunned Parisians and tourists - some crying, others offering prayers - watched on in horror in central Paris on Monday evening as flames engulfed the Notre-Dame Cathedral. 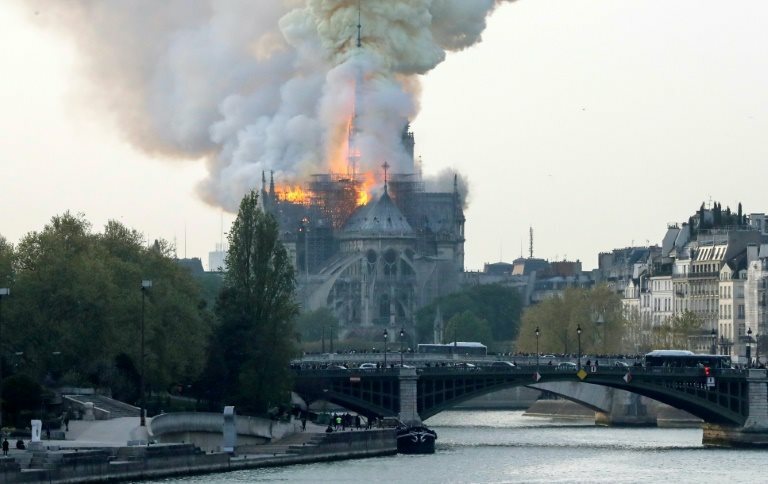 INTERNATIONAL NEWS - Crowds of stunned Parisians and tourists - some crying, others offering prayers - watched on in horror in central Paris on Monday evening as flames engulfed the Notre-Dame Cathedral. Gasps and cries of "Oh my god" erupted at 7:50 pm (1750 GMT) when the top portion of the church's spire came crashing down into an inferno that has spread to the entire roof. More gasps came a few seconds later when the rest of the spire collapsed, caught on the cameras of thousands of mobile phones. But throngs of onlookers kept trying to approach, snarling traffic as they massed on the stone bridges leading to the islands. Another woman passed by, tears streaming from behind her glasses, too overwhelmed to speak to reporters. "It's finished, we'll never be able to see it again," said Jerome Fautrey, a 37-year-old who had come to watch. "Now we need to know how this happened - with everything that's going on in the world, why Notre-Dame? Maybe it's a message from on high," he said. "It's incredible, our history is going up in smoke," said Benoit, 42, who arrived on the scene by bike. Sam Ogden, 50, had arrived from London on Monday with her husband, their two teenaged sons, and her mother. They had come to Paris specifically to see Notre-Dame, part of a world tour over years to see historic sites. "This is really sad - the saddest thing I've ever stood and watched in my life," Ogden said. She said the fire looked tiny at the beginning, "then within an hour it all came down." Her mother, Mary Huxtable, 73, said: "This (Notre-Dame) was on my bucket list to see. Now I'll never go inside." "This is a really historic skyscape and it's horrible this happened, on top of everything else Paris has gone through recently," she said, referring to the deadly jihadist terror attacks that struck the city in 2015. Her family had initially planned to visit Notre-Dame on Monday but opted instead for the Eiffel Tower, intending to go inside the cathedral on Tuesday.